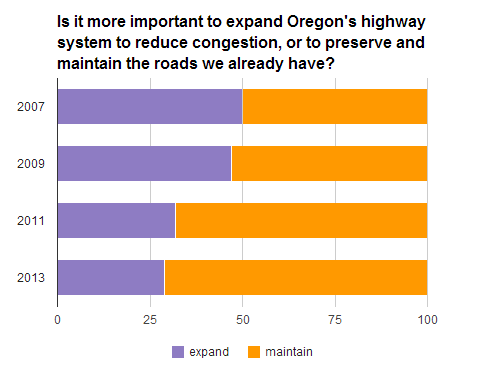 By more than a two-to-one margin, Oregon residents would rather maintain existing highways than expand them. That’s one of the most interesting findings from a recent survey of state residents taken by the Oregon Department of Transportation. As recently as 2007, almost 50 percent of Oregonians said it was more important “to expand the highway system to reduce traffic congestion” than “to preserve and maintain the highways Oregon already has.” As of this year, that’s fallen to 29 percent. Meanwhile, for the first time on record, more Oregonians said that “adding sidewalks and bike lanes to existing streets” is “very important” than said “expanding and improving highways, roads and bridges” is “very important.” In all, 40 percent of Oregonians gave high priority to more walking and walking facilities, while 34 percent said the same of road expansion. Let’s hope the state of Oregon tailors its spending accordingly. Elsewhere on the Network today: Transportation for America gives an update about how the federal budget negotiations underway right now might affect transportation. Systemic Failure describes how a Federal Railroad Administration rule actually punished a California community for making safety improvements. And The Architect’s Newspaper explains how Cleveland urbanists fought a proposal for a McDonalds with a double drive-thru and describes the layout they are pursuing instead. Why Is Portland’s Transit Chief Advocating for More Highways? After suffering an embarrassing defeat a year ago, the Oregon highway lobby is rattling the can for more money again. They have a list of highways they want to widen, and they say Portland's economy depends on it. In addition to the usual suspects, the highway cheerleaders include Neil McFarlane, general manager of TriMet, the regional transit agency. What a colossal disappointment from Ted Wheeler.